It was around 10:15 a.m. on a balmy July morning when 6-year-old Hannah Wagar went missing while playing in her family’s front yard. Within 15 minutes, the police department had issued an urgent bulletin asking the community to be on alert. 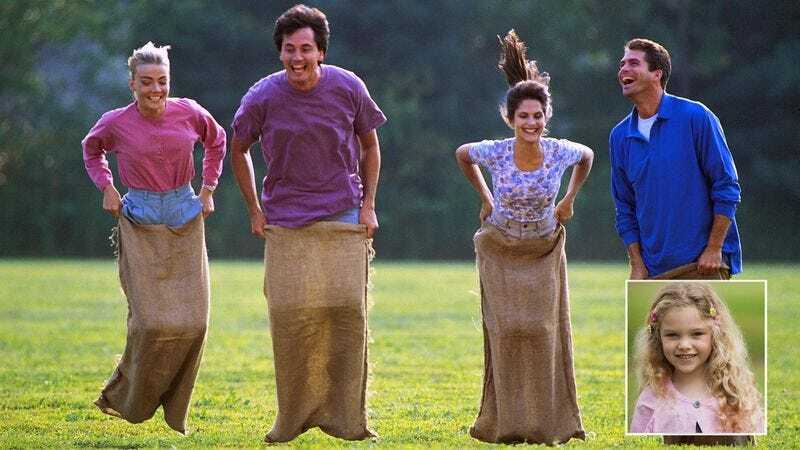 Within an hour, it seemed like just about all 3,846 residents of quiet Upland, Indiana united to search for the little girl, and then forgot what they were doing, and decided to have an amazingly fun sack race instead. The town’s police and fire departments also joined the search effort, with local news sources confirming that the entire Jefferson Township was flooded with rescue workers, all of whom also very quickly couldn’t remember what they were there to do in the first place and ran home to grab as many pillowcases or empty feed bags as they could find for the big race. Those who didn’t want to race participated in a game of egg toss at the other end of the field, while the old-timers took in all of the spectacle from lawn chairs on the sidelines. Eventually, someone put out a bowl of potato salad, and shortly thereafter someone else started grilling hot dogs. Within no time, the scene had turned into a fantastic town-wide potluck, with more than enough food for everyone to have seconds. Hopefully, the town of Upland, Indiana can teach us a few things about what can happen when a whole town comes together.